Heel pain is commonly caused by rolling over of the foot ('excess pronation'). As the foot pronates, the arch collapses and the muscles and supporting structures are forced to stretch and elongate. 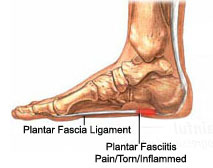 This puts stretch (traction)and strain on the ligaments running from the heel to the toes. In turn, the heel bone may 'respond' by developing a bony growth right in the centre of the -the heel spur. VASYLI products re-align the foot , reducing the stetch (traction) forces on the ligament - taking away this common cause of heel pain. We offers prime services and solutions, with the goal of providing the best and latest technology in Heel Pain at highly competitive prices. Thank you for your suggestion, but I believe as a physiotherapist, we provide even more valuable solution in assisting our patients recovery rather than just ask them to buy an expensive knee guide. You can read and try to understand how physiotherapist manage knee pain before you provide your comment. Shivam hospital is one of the well equipped physiotherapy centre.